12/11/2011 – With great dismay, The Netherlands Table Tennis Association (NTTB) acknowledge the death of table tennis icon Cor DU BUY. He died Friday after a brief illness at the age of ninety in the hospital in Amstelveen, The Netherlands. In 1937, at the age of sixteen, Cor DU BUY won his first Dutch Championships. He won his ninth and final Dutch title in 1955. He also won 13 national titles in the doubles and was the record holder of the NTTB Cup with 15 titles. Throughout his career, Cor DU BUY played 92 games for the national Dutch team. In 1963 and 1964 he was a successful coach of the Dutch men’s team. As Cor DU BUY was nearly unbeatable early in his career, the war time interuption is likely to have prevented his record from being even more impressive. DU hasere ?laclama Seo ilaclama bocek ilaclama ilaclama istanbul tanker su SeoBUY played many demonstration games and introduced his own sport gear. He sold table tennis tables, bats and balls. 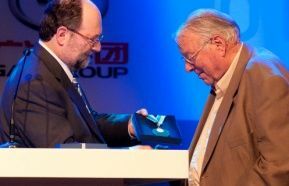 Adham SHARARA, president of the International Table Tennis Federation (ITTF) presented Cor DU BUY with the prestigious Merit Award for his contribution to the development of world table tennis at the opening ceremony of the World Table Tennis Championships in Rotterdam. In June 2011, Cor DU BUY was assigned the title of “Bondsridder”, the The Netherlands Table Tennis Association highest honor. In 1956 Cor DU BUY had already been awarded the title of honorary member of the NTTB. ETTU wish to express deep condolences to Cor DU BUY’s family and to whole Dutch Table Tennis Association.